We saw the first prototypes of the Pro82+ and Modu82+ series at CES, and we eagerly awaited our samples since then. At the following CeBIT in March, Enermax showed these two new series again but still we waited for our samples. After returning from CeBIT, we finally found our batch of PSUs at our doorstep and we started testing right away. It wasn't too long ago that Enermax introduced the Infiniti series, which performed well in our testing, so we were quite excited to see how Enermax would top that performance. We heard from Enermax that these two new series would have performance equal to the Infiniti but at a cheaper price point. We initially thought these new power supplies used the basic Infiniti design, but we were told that this is not the case. Enermax wouldn't be Enermax if they didn't include some new technologies in a new series. We will examine today what improvements Enermax made and how they function. We look at both new series today; they are essentially the same internally but play a different role on the outside. As the name suggests, the Modu series comes with modular cables. The Pro series doesn't have modular cables, which is the only difference between it and the Modu series. 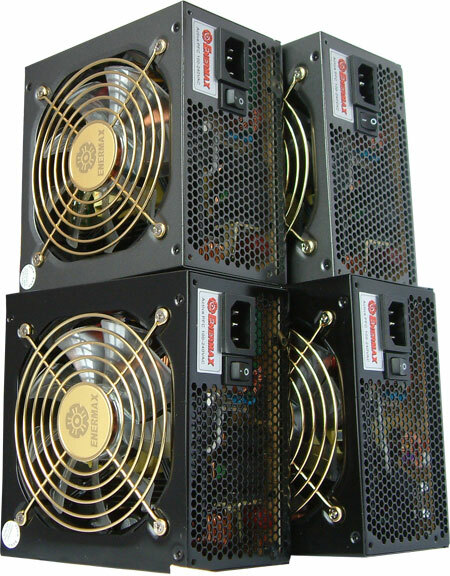 Enermax was one of first companies to begin selling retail power supply several years ago. They are one of the oldest companies in this field, with several inventions to their credit during this time. According to the company, Enermax was the first to offer a colored power supply, and they were the first to provide an external fan speed controller. We don't know for sure if that's really true, and we can't say that colored PSUs is really that revolutionary, but Enermax does seem to be at the forefront of new PSU innovations, and they rank in the top five in terms of sales. Their trend of staying ahead in the market place continues, with some very competitive power supplies in their two new series. Maybe it's only my impression, but isn't the choke wire outside of the PCB hole? "...there are two main capacitors..."
And who is the Mfgr of these for the Modu82+ series? Should I assume Hitachi as stated for the Pro82+ series? Are you sure there are three rails, what does the bottom of the main PCB look like? Photos please. According to your diagram the Modu82+ 525W has no floppy connector, Enermax specs state otherwise. "The solder joints in general aren't that great with Enermax,..."
Regarding Detailed Voltage Distrubtion , Efficiency & Acoustic Comparison: What were the results for the Modu82+ 525W? Due to marketing with higher and higher wattage PSU's, a lot of people still are clueless on how much a modern day system uses (or at least i am). So i was wondering of Anandtech can give typical systems in which would use said PSUs can be used safely and to maximize efficiency. If the vast majority of power can be served on the 12V rails, then yes. an 8800GT less than 100W at full power. You can be fairly certain that the rest of your system pulls less than your graphics card (at least if it's core duo...havne't looked into quad cores). When you go to PSU calculators, those figures they recommend are based on everything in your system operating at 100%. maybe it's just me, but I've never had my GPU, CPU, HD and DVD all going at 100% at the same time. At idle, you're probably pulling under 100W with an 8800GT (512mb). If you're overclocking, it can vary. i'm looking at the conclusion page and it says 350, 380, 385 !! !